b) Adding multiple indirect data connections. Izenda reports is designed as a modular system to be easily customizable for usage with any datasources. The AdHocContext class has a Driver property containing an instance of the Izenda.AdHoc.Database.Driver abstract class, which provides datasource metadata for Izenda AdHoc. All datasource drivers in Izenda AdHoc use this as their base class and layer functionality on top of it. Figure 1: The standard Izenda Driver model. Datasources are separate and the driver handles the heavy lifting of interacting with the datasources. 1. 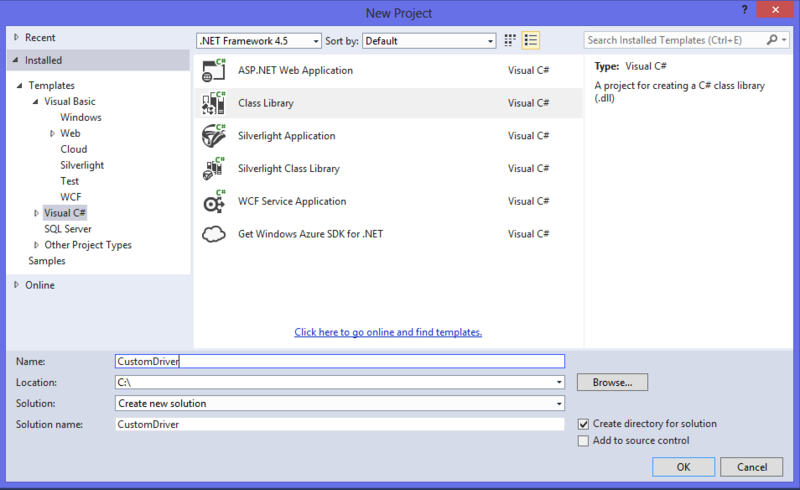 Create new project with type of Class library in Visual Studio. 2. Add Izenda.AdHoc.dll to the References in the project. The overridden fields can be seen in the Fields tab on the Report Designer after selecting the DataSource "Products" at the DataSources tab. a) Compile your CustomDriver project and copy the assembly to your website's /bin folder, and add the reference just like above. b) Set AdHocContext.Driver = new CustomDriver in the Session_Start() or Application_Start() method. 6. You must also override some other methods like GetDataSet(). This method accepts a System.Data.IDBCommand parameter, and returns the corresponding DataSet. Overriding this method allows you to pre-process the dataset before returning it. You may use AdHocContext.CurrentReportSet to get additional details of the report. For integrations that will not utilize SQL queries in the command object, Izenda.AdHoc.AdHocContext.CurrentReportSet may be used to get the report state. //result = new DataSet(); //If you want to implement your own method for obtaining a DataSet. You can also see more coding examples here. The Izenda Fusion Driver composes data sources from several connections (data providers) into a single data source. This is very similar to how SSAS works, but using Fusion you can aggregate data not only from MSSQL databases but from very different data sources. For example, you can get data from the OData data provider (i.e. without a direct connection to the database). All you need to do is set up the data sources' connections and you will be able to work with aggregated data as a single data source. Figure : Schematics of how the Fusion Driver interacts with different datasources. Instead of working with individual datasources, it aggregates the datasources into one. Now you can add connections to the data sources end points. The end point could be a direct connection to the MSSQL database or it can be an OData connection to the MSSQL or Oracle database. 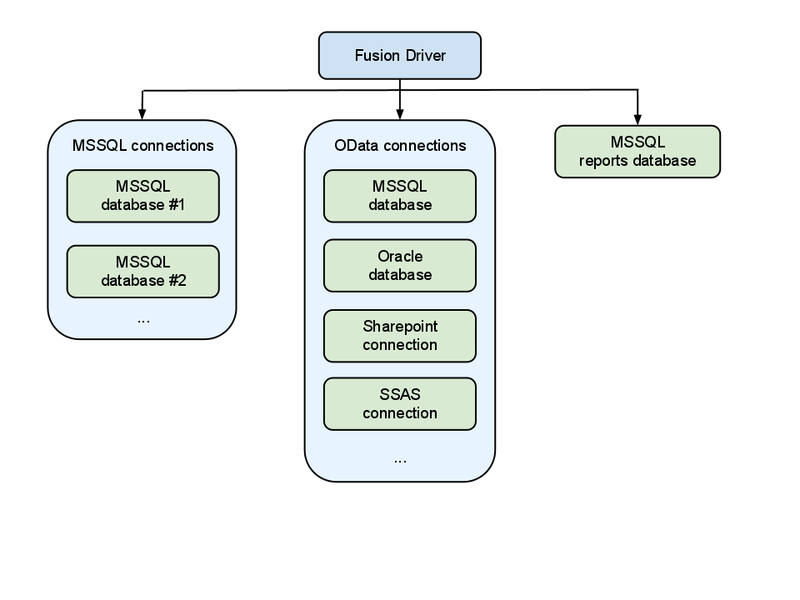 When using a FusionConnection with indirect database connections such as OData, the setup for VisibleDataSources is a little bit different. You will see an example below of setting up VisibleDataSources with indirect connections. Note: This does NOT apply to direct database connections. However, calling FixVisibleDataSources with direct database connections will not have any adverse effects on your VisibleDataSources. When using indirect database connections and saving your reports to the FileSystem is not an option, you can use the SavedReportsDriver setting to specify a direct link to a database where you can store your reports. The following example sets up the connection string to the database that contains the reports table. If you store reports in the file system then skip this step(use FileSystemAdHocConfig if you do this). Getting data from several data source providers may take a lot of time and resources when many connections are added. This will result in a slow connection to the providers due to large amount of data being transferred, etc. That’s why the cache is enabled by default for the Izenda Fusion Driver. By default, cache expiration time is set to 12PM on Saturday. This means that every Saturday, the cache will be cleared and all data will be requested from the providers during the next session. Note: The GetAllConnections method within the FusionDriver class is where all connections for the current driver are stored. You can iterate over the collection and ping the database with a small bit of data in order to determine if the connection string you are using is obtaining results properly. 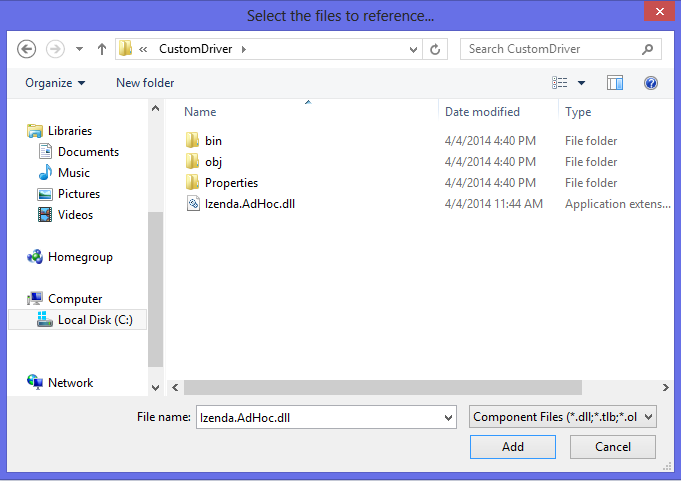 You can then set the AdHocContext.Driver property to your CustomFusionDriver and you're done!